Mátyás Seiber was one of that distinguished group of European composers (others were Roberto Gerhard and Egon Wellesz) who sought refuge in Britain from Nazi tyranny. Seiber, a pupil of Kodály in Budapest, brought with him his Hungarian heritage and a love of jazz as well as an awareness of the music of his most distinguished contemporaries, Bartók and Hindemith – and, to a lesser degree, Schoenberg. All these influences eventually became distilled into a personal style whose further development was cruelly cut short on 24 September 1960 by a fatal car crash in the Kruger National Park during a visit to South Africa. I am indebted to Thea King for the information that the Concertino was sketched during a train journey from Frankfurt to Budapest in 1926. The work began life as a quintet titled Divertimento for clarinet and string quartet. Its composition occupied Seiber on and off until 1928 and was his only major composition during that period. The present version for clarinet and string orchestra dates from 1951. In common with many of his contemporaries at the time, Seiber became converted to neoclassicism, but Hindemith’s version of it rather than Stravinsky’s, and the Concertino reflects this preoccupation. It is possible to find in the opening Toccata some of the rhythmic elements associated with trains – running quavers punctuated by octave interjections suggesting wheels, rails and points, but the simile ought not to be taken too far. The Toccata develops into a lively contrapuntal exchange between soloist and orchestra in a modified sonata form with a brief development and the first subject reappearing in reverse order in the recapitulation. The ‘Variazioni semplici’ is, as its title implies, a brief set of variations on a simple but endearing melody whose outlines evoke Hungary. The Scherzo, a witty but slightly acidic ‘joke’, obliquely reminds us of Seiber’s long-term interest in jazz, though the slap-tonguing demanded of the clarinettist has little to do with that beloved by the Ted Lewises and Wilton Crawleys in the New York of the 1920s. 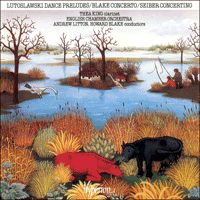 The Recitativo, subtitled ‘Introduzione’ (presumably to the finale) is another folky piece, full of atmosphere and coloured by rapid arpeggios on the clarinet, reminiscent of Bartók’s ‘night music’. Bartók, with Kodály, again comes to mind in the rapid finale, a dance whose outlines call up many such in the works of those two great collector-composers. A coda, pierced by shrill exclamations from the clarinet, again hints at that train journey, or at least its arrival at the Keleti terminus in the Hungarian capital. Howard Blake was born in London in 1938, but grew up in Brighton. At eighteen he won a scholarship to the Royal Academy of Music in London where he studied piano with Harold Craxton and composition with Howard Ferguson. Then, during the next ten years, he proved himself a highly versatile, all-round musician, working in London as a pianist, conductor and orchestrator, but especially as a composer. In 1971 he left London to live in a watermill in Sussex, and started to forge a personal style of composition – rhythmic, contrapuntal, and above all melodic. Since then there has been a steady stream of works in many different forms: a Divertimento for cello and orchestra, the Clarinet Concerto, a Piano Quartet, Sinfonietta for brass, song cycles, a comic opera, piano music, and the large-scale choral and orchestral work Benedictus which has been given many major performances including the Three Choirs Festival 1987, Westminster and Canterbury Cathedrals, and Kings College, Cambridge, in 1988. Howard Blake’s Barbican concerts for children enjoyed a huge success, featuring his music for The Snowman with its much-loved song ‘Walking in the Air’. Howard Blake has also composed widely for ballet, television, the cinema and the theatre. He lives once again in London and most of his music is now published by Faber Music. The Clarinet Concerto was commissioned by Thea King and first performed by her at the Queen Elizabeth Hall in London in June 1985, with the English Chamber Orchestra conducted by the composer. A nine-bar recitative leads to the first movement, ‘Invocation’, which develops a mysterious, syncopated theme in G minor. A horn note dies away to a second recitative which leads to the slow movement, ‘Ceremony’, a hushed cantilena using the clarinet’s capacity for sustained lyricism. The third movement uses its capacity for rapid passagework in the form of a restless but exuberant ‘Round Dance’ – an accompanied cadenza returning to the recitative material from the beginning of the work and confirming the strong feeling of the piece as being in one movement.